Vanessa Hudgens is known for her acting and singing chops, but we should pay attention to her killer style too! 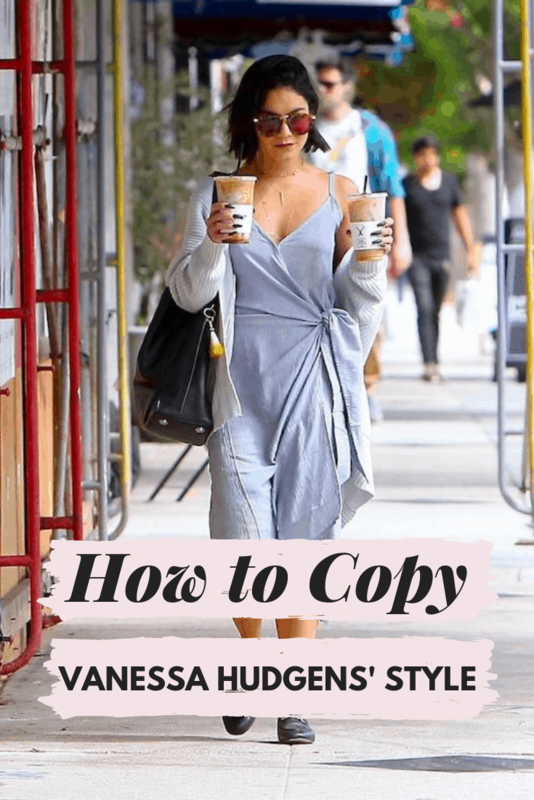 Here’s how to copy her look. 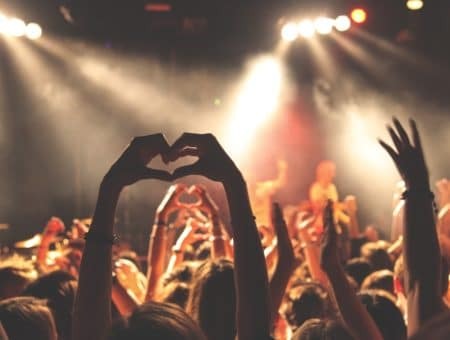 You probably fell in love with Troy and Gabriella at a young age, watching High School Musical‘s teenage love story unfold while you belted out all of the songs. Today, I hope you’ll fall in love with Gabriella all over again, because Vanessa Hudgens is a fantastic source of fashion inspo. With the four following sets, we’ll break down Vanessa’s fashion style and show you how to get her look for less. In this outfit, Vanessa looks confident and ready to head to a Hollywood meeting. Rocking a matching blazer and shorts, Vanessa looks classy yet on-trend, combining her set with a plain boat-neck tank and unique heels. I love how the heavily decorated ankle straps and open-front slits on the heels give a badass boost to the outfit. In dark, moody makeup (that lipstick shade though!) and a slicked-back low pony, Vanessa means business, and who wouldn’t want her as a boss? 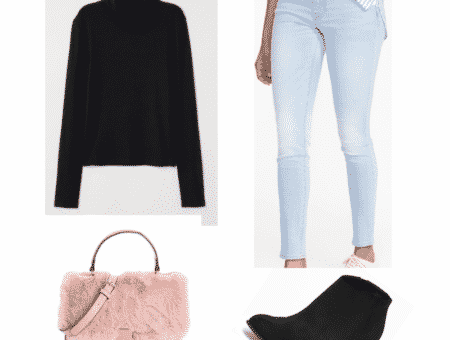 Get this look for yourself by swiping on a deep, red wine lipstick, rocking a similar pair of open-front booties, and pulling on a comfortable tank top. And because it’s so difficult to find sets that fit perfectly, why settle? Build your own pinstripe makeshift suit with this blazer and these high-waisted shorts. I am obsessed with this look. From head to heels, Vanessa shows off her playful, modern, and vibrant side in this outfit. Here, she rocks a sleek bob that just brushes along her shoulders, minimal and pink-based makeup, a vividly colored pink long-sleeved sweater, a one-of-a kind checkered peach/pink/yellow skirt held up by a thick black belt, and finally, studded pointed-toe heels. Before we get into how to recreate this style for yourself, let’s talk a little more about this skirt. I haven’t seen anything like it in stores recently, and it’s giving off major ’60s vibes. The check pattern, the button down detailing, and the length, not to mention the fantastic color, make it something extraordinary. Pairing it with a neon pink top is a bold fashion risk, and I think it pays off for Vanessa. To get this look, you’ll have to search to find a similar skirt, but it’s not impossible! This one from Boohoo has a similar vibe to Vanessa’s. Next, find a bright neon top of your choice, and work with where the hemline falls to complement the skirt and top together (tuck in as needed). Next, pull out that bold pair of studded heels and a chunky black belt, and there you have it! In a unique combination of a textured brown/rust colored jean jacket, a heavily strapped bohemian dress, and a mix of perfectly overlapping necklaces, Vanessa channels a natural vibe with this look, almost as if she is about to frolic in a meadow for some Instagram snaps. Her pointed, midnight black mani gives her otherwise-innocent look a bad girl feel. Get Vanessa’s look for yourself with a corduroy jacket (or just any brown/tan jacket), a flowing or pleated maxi-dress in a neutral tone, and a layered set of gold/bohemian necklaces. Add your own fierce manicure for a hint of edge. This look makes me happy, and with the winter months rapidly approaching, I’m already longing for the spring days when I can pull out my straw bag and hat. If you’re fortunate enough to have any vacations planned in the months ahead, this look is great inspiration. The main feature of this look is Vanessa’s childlike yet sophisticated white linen dress, which features an incredible square neckline and short sleeves. The accessories do the heavy lifting in this look – Vanessa has piled on round sunglasses, a straw bag and beachy hat, and subtle gold jewelry on her wrists and in her ears! 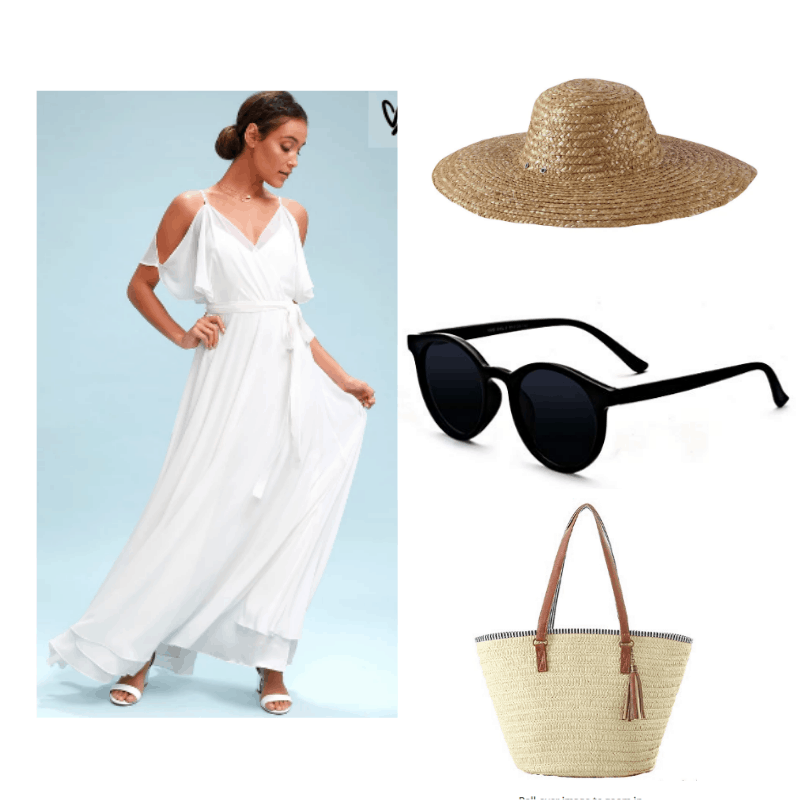 Get this look for yourself with a flowing white maxi dress, a piece you can find in many different styles across sites and brands. Look for something eye-catching, preferably with an interesting detail like Vanessa’s buttons or square neck. Next, pull out your straw hat and handbag, as well as any pair of sunglasses. Do you still follow Vanessa Hudgens and her style? Comment your favorite look below!